eCigs HQ: Green Smoke Holiday Discounts & 20% OFF Coupon Code! Home » e-Cigarette Coupon Codes » Green Smoke Holiday Discounts! Take advantage of these special offers while they last. Stuff your stocking with Savings on Green Smoke’s Holiday Kits! The 2012 Holiday Season is set to be a great one with the release of Green Smoke’s Overstuffed Holiday Kits. These December treats will be available beginning Monday, December 3rd. Their limited time appearance will conclude December 30th (inclusive). The Green Smoke lineup offers multiple options to purchase a kit for yourself or that special smoker in your life. No wrapping necessary with Green Smoke Holiday Kits, all of which come in a special holiday box. Includes 1 Battery, 5 FlavorMax™ Cartomizers, 1 USB Cigarette, 1 USB Charger, 1 Wall Adapter and the new Green Smoke Leather Case. Includes 1 Long Battery, 1 Short Battery, 10 FlavorMax™ Cartomizers, 1 USB Cigarette, 1 USB Charger, 1 High Powered Wall Adapter, 1 High Powered Car Adapter and the new Green Smoke Leather Case. Includes 3 Batteries, 10 FlavorMax™ Cartomizers, 1 USB Cigarette, 2 USB Chargers, 1 High Powered Wall Adapter, 1 High Powered Car Adapter and the new Green Smoke Leather Case. Click here or the banner above for the Green Smoke Holiday Kits Sale. Green Smoke 20% OFF Coupon Code! 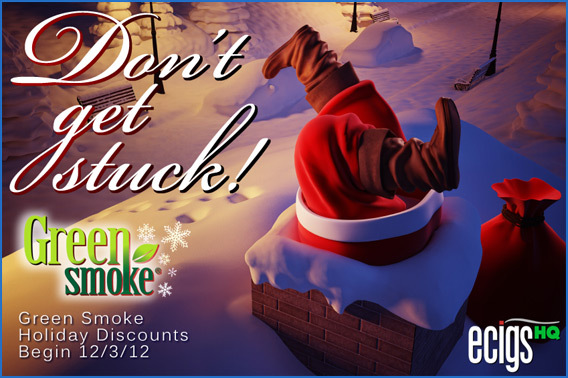 With a little more than a week to Christmas, you can get 20% savings on almost all Green Smoke’s most popular products. Click here or the banner above and use the 20% OFF Coupon Code pictured above to save! OFFERS SUBJECT TO CHANGE/WITHDRAWAL AT ANY TIME WITHOUT PRIOR NOTICE. Reviewed by Admin in e-Cigarette Coupon Codes, e-Cigarette Special Offers | Comments Off on Green Smoke Holiday Discounts!